What's different about the moon tonight? It's inside your room! This authentically detailed model of the moon hangs on your wall and shines moon light just like the real moon. The twelve different phase settings let you match what the real moon looks like outside. Switch the moon on and then you can set the phase you want by using the remote control. The RC allows for manual function or automatic mode for viewing the moon's phases. There is also an auto shut-off mechanism to preserve battery life. It is really easy to set up and no mains electrics are required. The Moon In My Room is an accurate curved relief of the real thing, and is designed to be mounted on your bedroom wall. Using a mini remote control, you can control the phases of the moon, or leave it on automatic and watch it phase through twelve stages from Waning Crescent through Waxing Gibbous to New Moon. The Moon will automatically turn itself on in a darkened room, and turn itself off after 30 minutes (though you can override this feature if you wish). It's powered by just four AA batteries (with 2 AAA's in the remote). 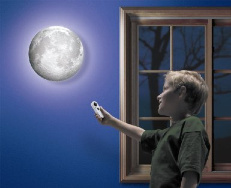 Your Moon is light sensitive; it will automatically start illuminating in a darkened room. It automatically shuts down after 30 minutes of inactivity to save battery power. Suitable for ages 6 years+. Size: 26 cm x 26 cm x 6 cm.